Agriculture is the dominant employment providing sector in economy and as such, has a huge impact on welfare of people. In recent times agro based industry especially food processing has come under intense focus. This is on account of the huge growth potential as well as the labour intensive nature of it. Perishable nature – Products are of perishable nature and thus it requires huge infrastructure in terms of cold storage, good road connectivity etc. India suffers on account of both forward and backward linkages. operations related to production, scheduling, and quality control. Sugarcane industry in India is suffering on account of poor export scenario, large arrears due on sugar manufacturers, over regulation in the sector. Since the advent of globalization of trade, developments in one region has an impact on all other regions. For instance, the sugar prices globally are low which affects the Indian manufacturers. 1. Well functioning agriculture sector is critical for the overall macroeconomic framework. Inflation in India is largely due to supply side constraints and as such any variability in performance in agricultural sector has a direct impact on the poor. 4. 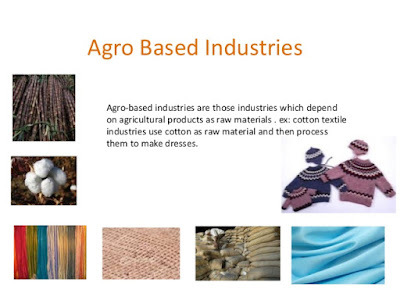 Agro based industry provide raw materials for several other industries. Thus other industries are also dependent on this feeder sector. 5. It affects the nutritional security of the country. Agro based industries are receiving adequate attention from the government through schemes like Make in India (Food Processing), Pradhan Mantri Krishi Vikas Yojana etc. The PM’s dream of doubling farmer income by 2022 is dependent on this sector’s performance.